Moriarty and Thornton are inside the qualifying mark with two rounds to go at Sherry Golf, where 18 places are up for grabs. Clandeboye's Jonathan Caldwell, who earned his card at the school last year but failed to retain it, is just inside the top 19 who qualify at Hacienda del Alamo. But the other nine Irish hopefuls need to pull out the stops now to make it. Eddie Barr and Michael McGeady are six shots outside the qualifying places with David Higgins seven adrift of the top 18 after a second round 76 in Jerez. At Costa Ballena near Cadiz, Royal Dublin amateur Niall Kearney (73) and St Margaret's John Kelly (71) are five strokes outside the leading 19 players to qualify there despite getting to one under par. "It was windy," Kelly wrote on Twitter. "Dropped to 47th. Two good rounds needed now but it can be done." Lurgan's Gareth Shaw and Munster men Michael Collins and Cian McNamara have it all to do at Arcos Gardens. Shaw carded a 76 to slip back to two over par and four shots outside the top 19 qualifiers with Collins and McNamara six shots off the qualifying pace in tied 52nd on four over. 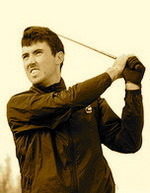 T52 Michael Collins (+4) 75 73; Cian McNamara (+4) 74 74. It all comes down to one round for the 12 Irishmen in action at the second stage of the European Tour Qualifying School and with just three of them in position to make this week's finals, it represents the last throw of the dice.